All The Pretty Dresses: American Civil War Era Ball Gown in Robin's Egg Blue! 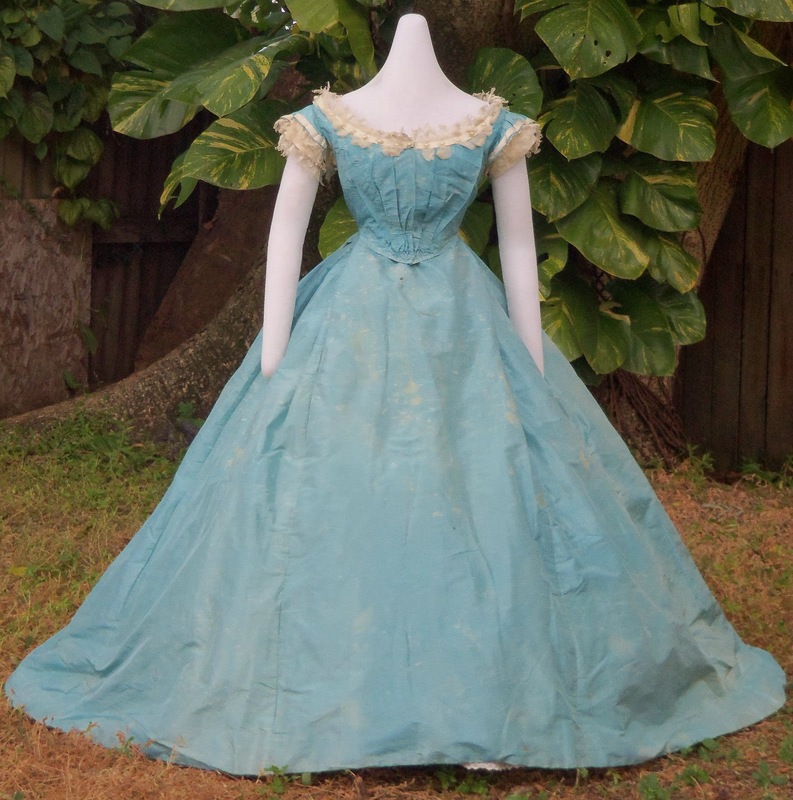 American Civil War Era Ball Gown in Robin's Egg Blue! 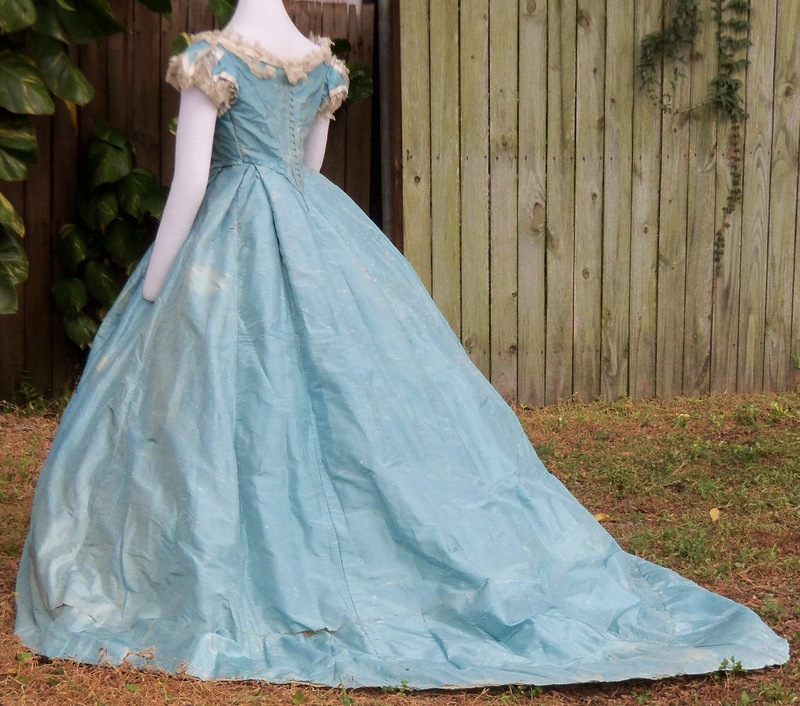 This auction is for an original Lady's Ball Gown from the Civil War period. 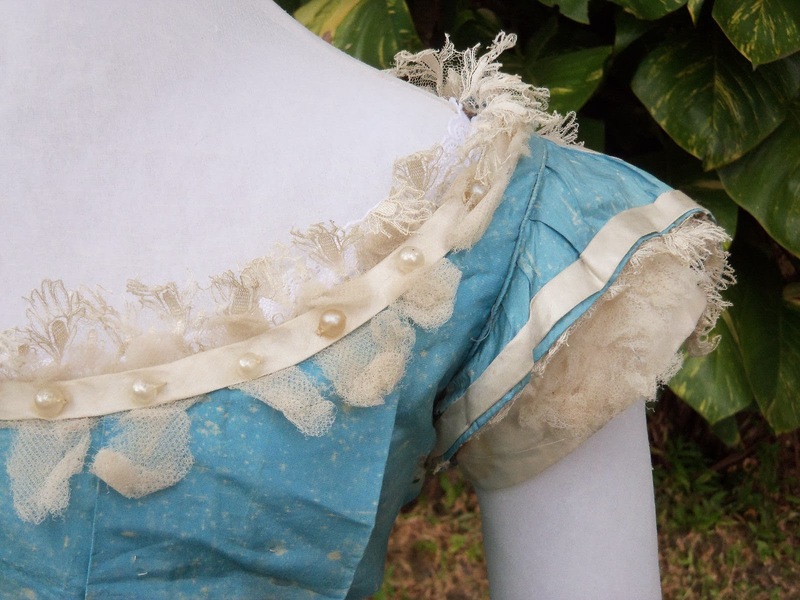 Its fabric is a lovely blue silk taffeta lavishly trimmed with white satin, tulle and lace. 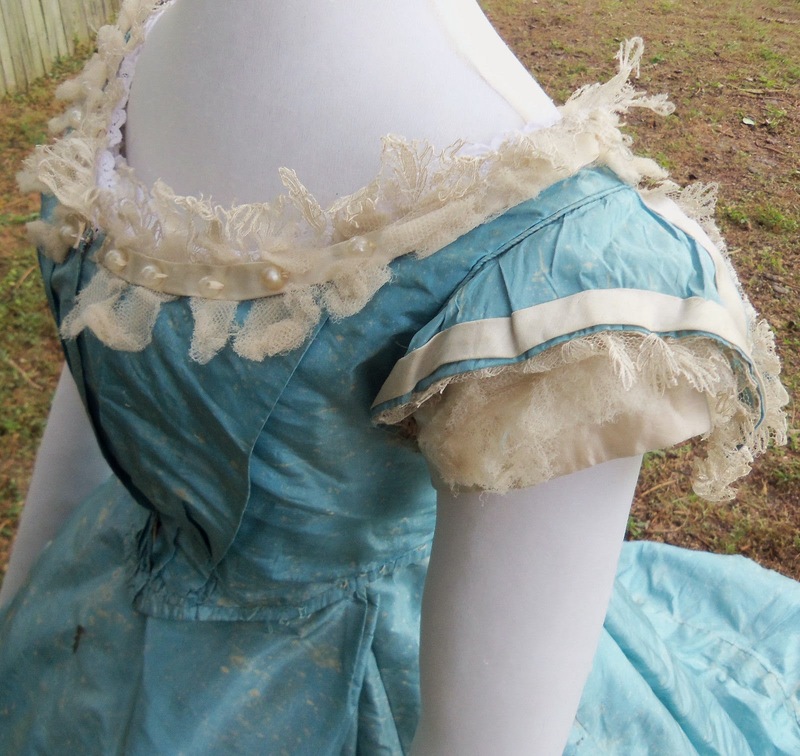 The white stain trim around the neckline is studded with glass fish scale pearls. The dress is beautifully made with a gathered bodice and pleated skirt. It is pleated at the armholes and the bodice hem is bound with self fabric. There is evidence that the dress was altered in the period to a slightly later style and made to accommodate an expanded waist. 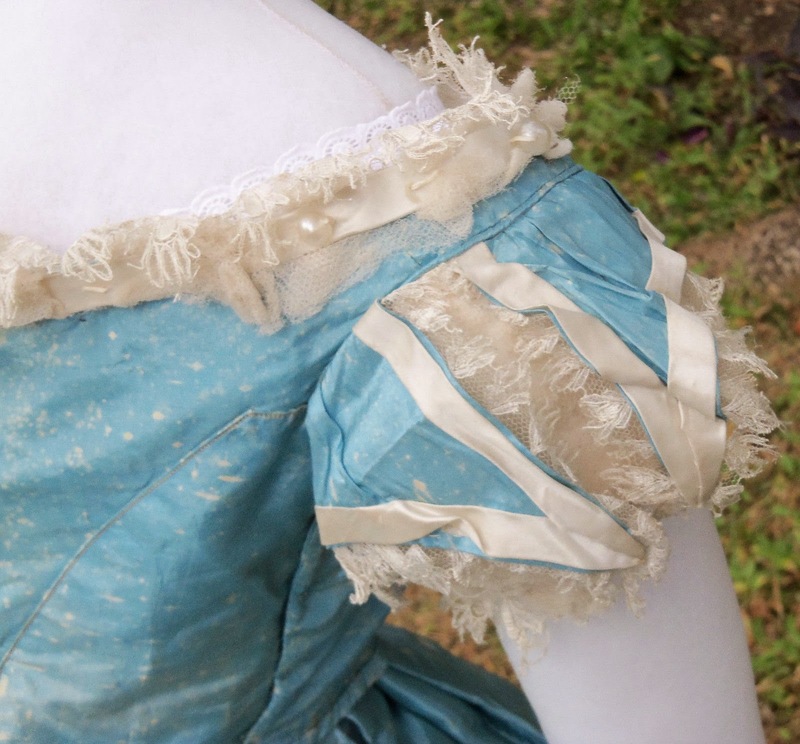 Triangular inserts were added under the arms- I have pinned them closed to fit my mannequin. The back lacing was stitched closed and a front closure of hooks and hand-sewn eyelets was made. 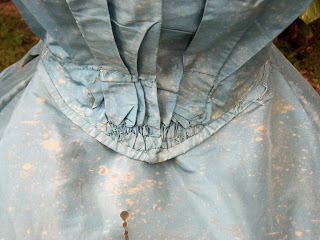 In addition, the skirt was re-pleated and pieced fabric indicated the train was greatly lengthened. The chances appear to be consistent with the period. I theorize that the inserts were added for a pregnancy. Please note any accessories & under garments shown w/ this dress are not included in the auction. Condition: CONDITION IS GOOD WITH SCATTERED OVERALL FOXING FROM THE BREAKDOWN OF THE DYE, SCATTERED SMALL HOLES, A COUPLE OF REPAIRS AND BREAKS IN THE LACE. THE TULLE TRIM IS MOSTLY GONE. STRUCTURALLY, IT'S STILL HANGING IN THERE AND STILL LOOKS FANTASTIC DISPLAYED. 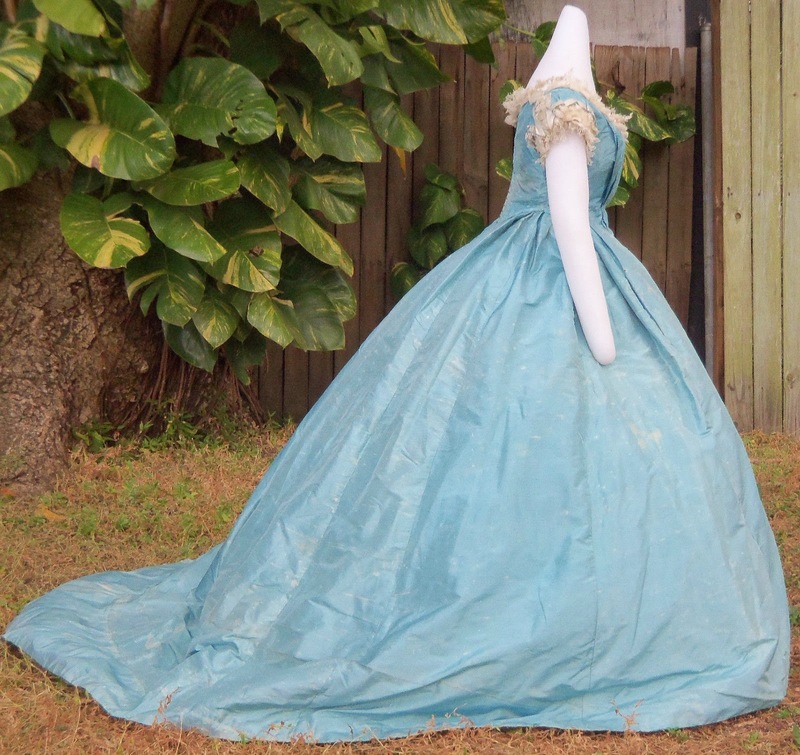 Measurements are: The bust is 33 inches & the waist measures 26.5 inches. The length of the skirt is 40.5 inches in front and 65 inches at the back. The hem measures about 196 inches around. I adore this! However, I doubt - heavily- that the inserts were added fro a pregnancy. 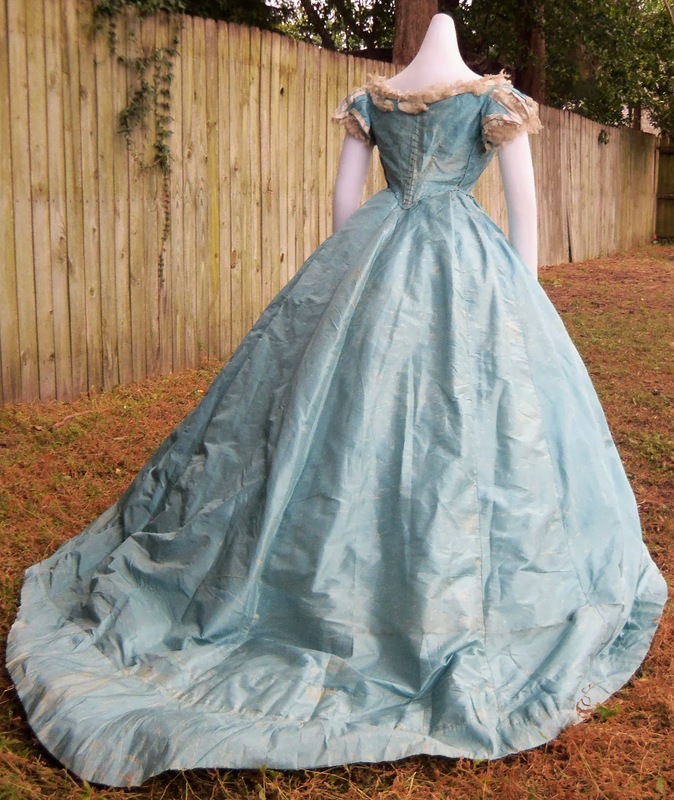 Rather, the dress was probably an 1840's fan front remade into a ball gown. 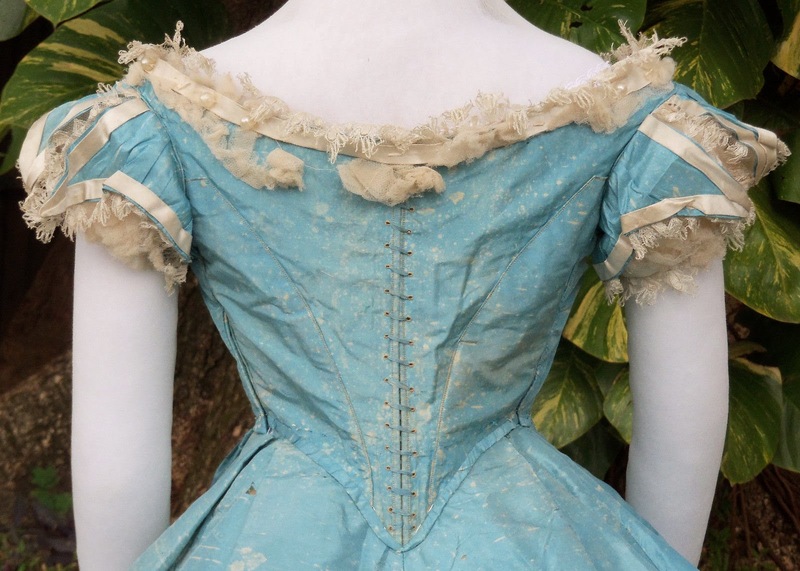 Given the older style, the dress probably needed to be made to fit a new person (or the lady gained weight) and inserts had to be added. This was VERY common - which is why there are so many fewer 1850's dresses than 1860's still existing - with wars in India and the United States, the cotton and silk trades were heavily affected. 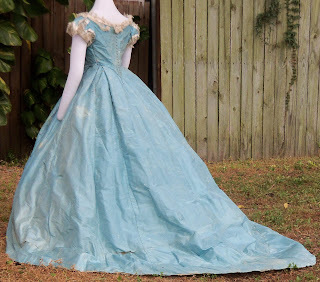 Rather than paying the ridiculous prices for fabric, you just remade the gowns you had in the styles you wanted. 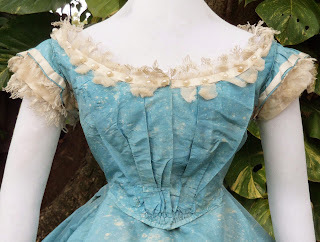 Seeing a late 1840's dress remade into an 1860's dress is also very common - particularly if the lady had bought a ton of the silk to begin with. How many of us have fabric lying around for years because we bought too much of it for *that* dress? I think anyone that sews has done that.